For when you need to communicate powerfully, be positioned as a thought leader within your industry and provide credibility to potential joint venture partners. The way you are represented online is crucial. Digital marketing will increase your visibility, increase your connectivity, counteract competition, legitimate your purpose and showcase your expertise. And one of the biggest heavy-weights in your arsenal of digital marketing strategies will be your website. 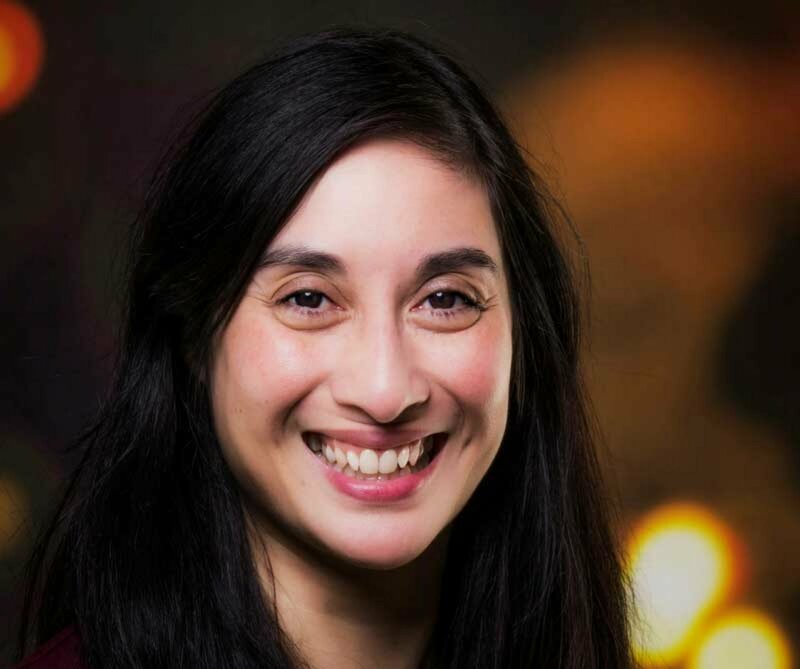 Meet Rachel Everett – a journalist, editor-in-chief, PR and branding consultant. 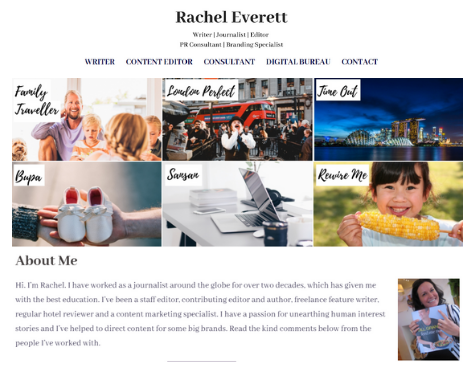 Rachel needed a bespoke photo-intensive portfolio website that would feel clean and fresh with bespoke graphic design elements and links to published works. 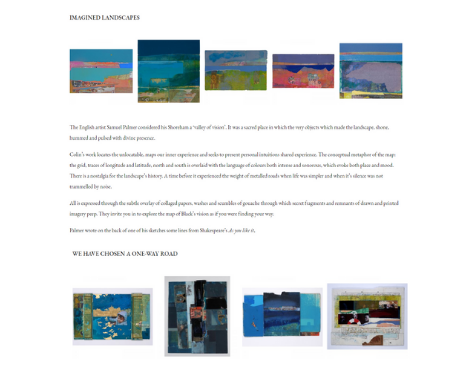 I really hadn't put any time into organising my website as I was too busy with client work! But I was recommended Mits by a business colleague. Mits works very quickly and offered lots of great ideas to enhance my site. 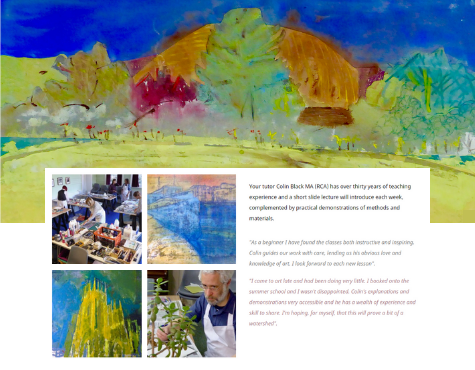 I now have a beautiful website that showcases my work and illustrates my style PERFECTLY! Enlisting a professional like Mits makes web-design A LOT easier to navigate through and really helps to speed things up. Thank you, Mits! 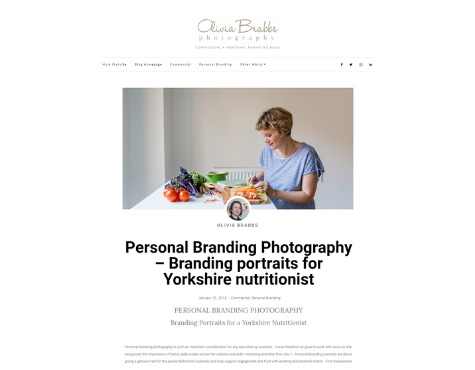 Meet Olivia Brabbs – a photographer specialising in commercial and personal branding photography. 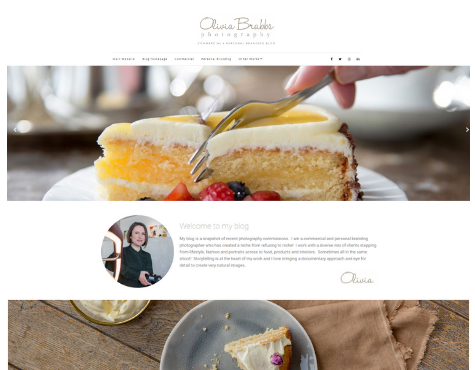 Olivia needed a bespoke photo-intensive blogging website. 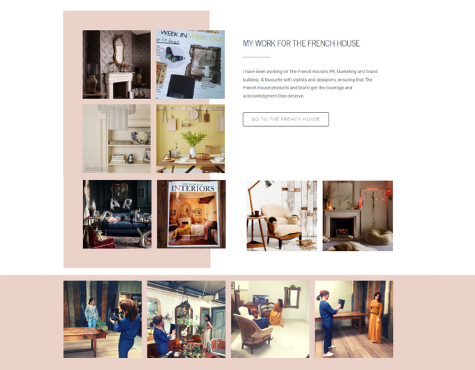 Her previous blogging site was outdated and did not reflect her expertise and creativity, and although she had a main photography website independently held and built elsewhere, she required a stand-a-lone blogging platform that could captivate and engage her growing audience. 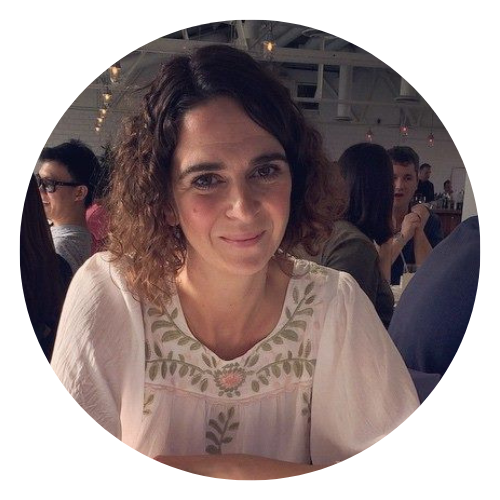 Meet Ursula Warrington – an independent and specialist caterer. Ursula required a new website after her original template website (built elsewhere) ceased to reflect her professionalism and creativity. 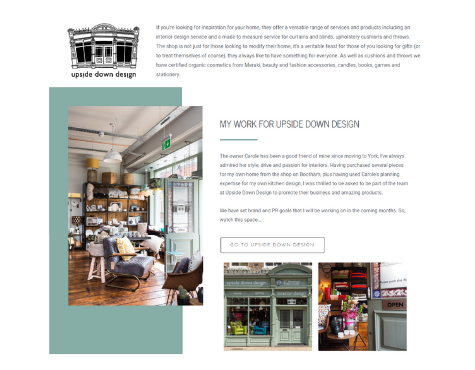 Ursula needed a bespoke colourful and playful website that would reflect her faithfully and showcase her extensive expertise. When I met Mits to discuss the audit for a previous site I was immediately impressed. She is so easy to communicate with — real, down to earth and believable. She listened and understood my product and message. 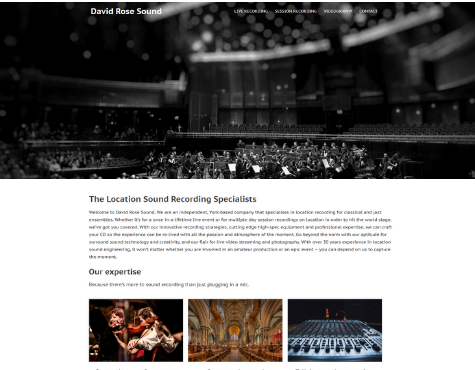 With extensive knowledge in technology, keen attention to detail and most importantly creativity - you couldn’t ask for better! Her web design ticked ALL the boxes. I highly recommend Mitsgriffin to any business or organization! Thank you Mits! GETTING LAUNCHED SOON!! 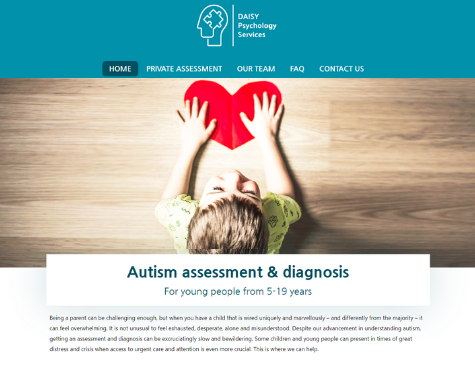 Meet the team at DAISY Psychology Services – who specialise in providing assessments to children and young people for possible Autistic Spectrum Conditions. 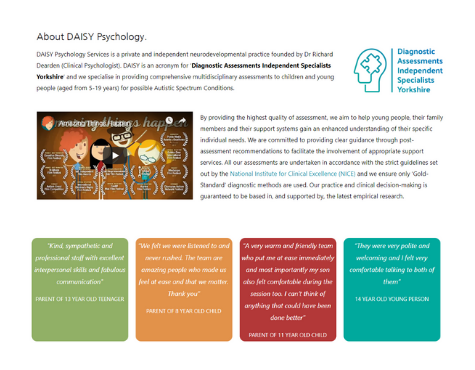 DAISY needed an engaging and highly informative website that showcased their expertise and enabled clients to get in touch easily. 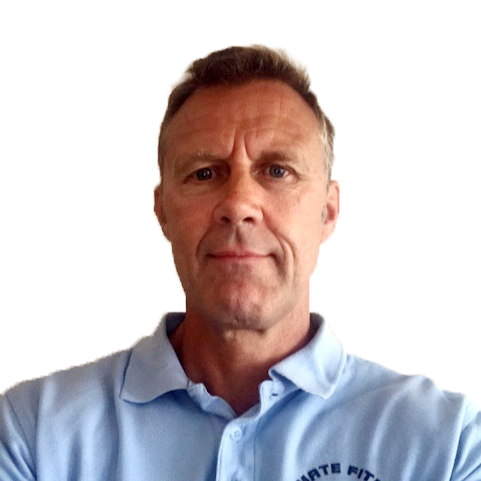 Meet Shaun Sutcliffe – a LED Light Therapy and Deep Tissue and Sports Massage specialist. 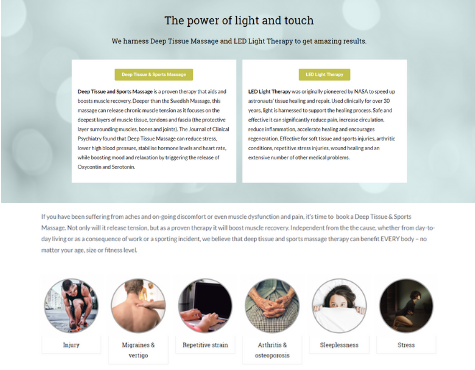 After the success of launching his business last year, Shaun expanded into the highly progressive and novel field of Light Therapy. 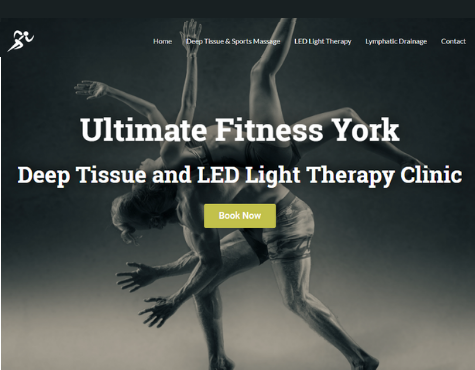 Pioneering this technology in the UK, Shaun needed a website re-design to faithfully represent his expertise and promote him as one of the leading LED Light therapists within the UK. If you suffer from constant pain and discomfort do check Shaun out!! I needed someone who was trustworthy who would not pull the wool over my eyes. There’s plenty of people out there who are making promises but just can’t carry it through. Mits is absolutely NOT in that category. You’ll not meet a more genuine and honest business woman. So helpful, knowledgeable and full of integrity! I have absolutely no issue in recommending Mits to anyone. 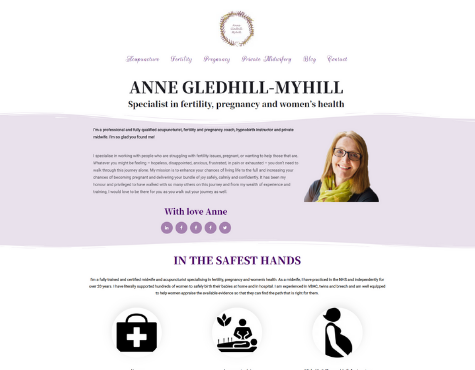 Meet Anne Gledhill-Myhill – a professional and fully qualified acupuncturist, fertility and pregnancy coach, hypnobirth instructor and private midwife. 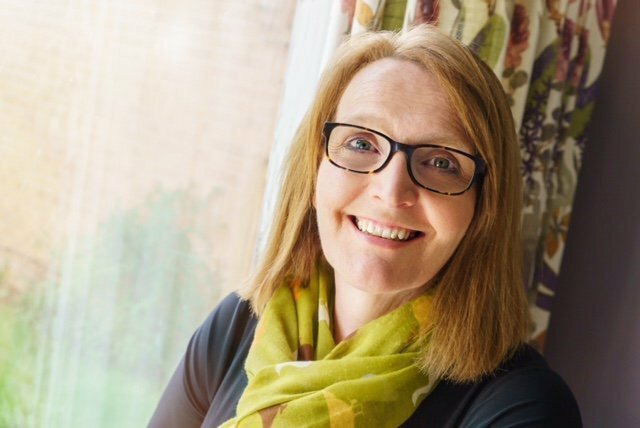 Anne needed a bespoke business website to showcase her extensive expertise but in a fresh, clear and simple way. 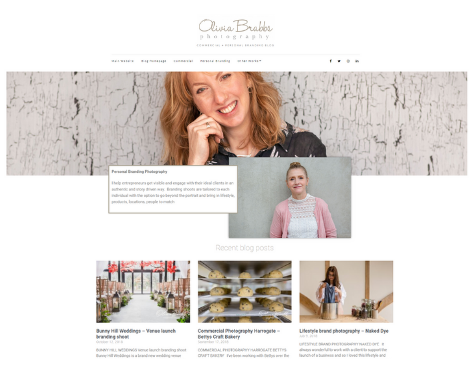 With an extremely hectic timetable, Anne needed a designer who could run with just a few pointers and develop a site with minimal input from her. Mits Griffin is great to work with. I am not at all technologically minded and found getting my head round a website a challenge. Mits came up with the ideas and delivered very quickly. 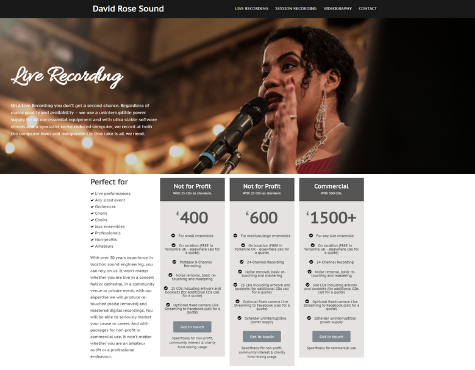 I highly recommend her to anyone needing a website. 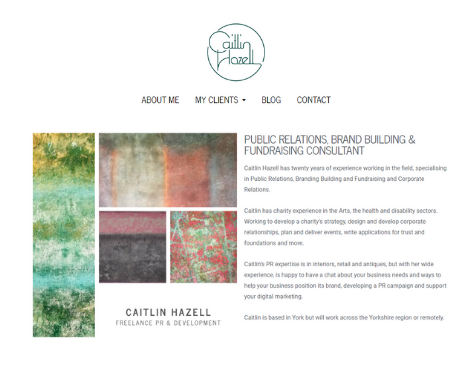 Meet Caitlin Hazell – a freelance specialist in PR, branding, fundraising and corporate relations. Caitlin needed a first business website to showcase her growing portfolio and promote her strategic alliances. Her brief was a simple understated design without any compromise on her expression of style or site functionality. 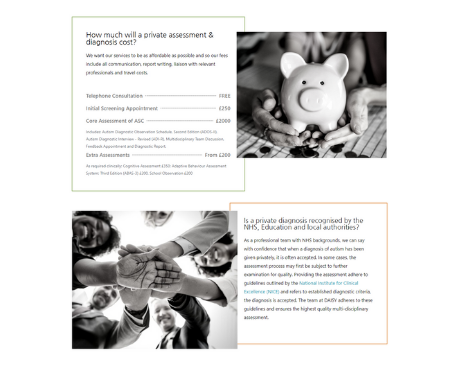 Mits interpreted my brief and understood what I wanted to achieve, better than I could have anticipated and was on hand to offer advice on copy, design and functionality. It was such a pleasure to work with Mits. Thank you Mits for interpreting my brief and ideas perfectly, I can't recommend you enough! Meet Marygate Preschool – an OFSTED outstanding preschool and a Charitable Incorporated Organisation. 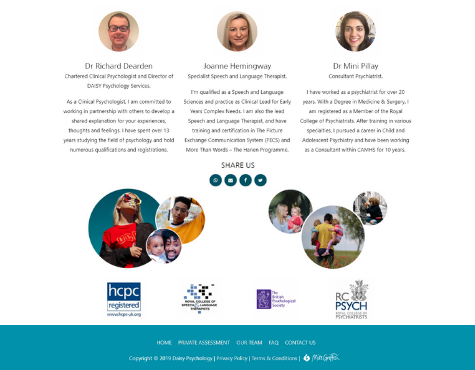 Marygate needed a bespoke professional website that would showcase the charities expertise and ethos while highlighting the duality of being child-orientated but parent-supportive. Struggling to market and fill places within a year of their website launch they have reached 95% capacity. 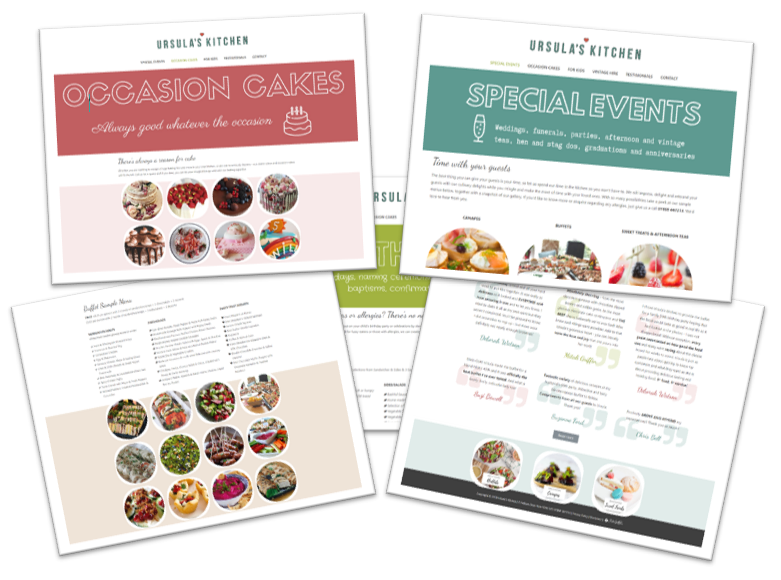 We looked into developing a website but found ourselves completely overwhelmed. 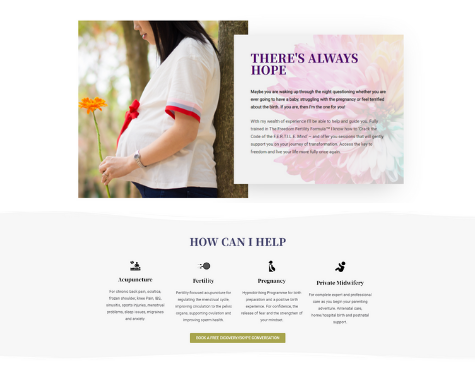 Mits came by recommendation and we have been very surprised with how quickly she was able to take our ideas and create our site. Mits you are amazing at understanding what we wanted without us being able to describe it. Feedback from families and professionals has been very positive and it has generated numerous enquiries which has in turn increase our occupancy! We are more than happy! 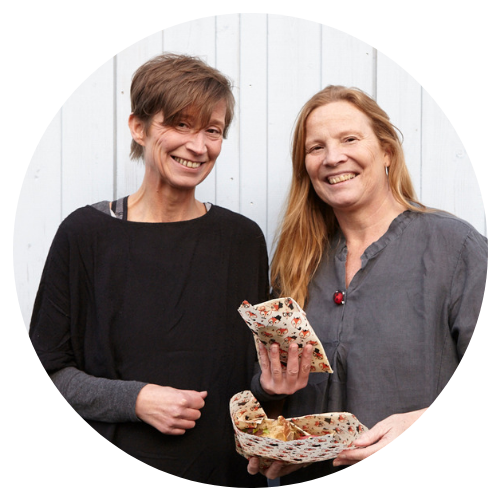 Meet Julie and Kirsty from Bumble Wrap – an E-commerce Eco-wrap business. 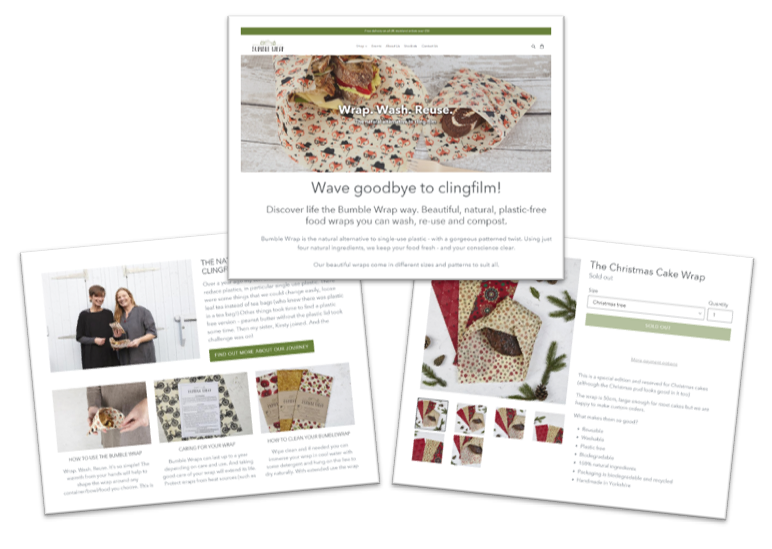 Julie and Kirsty needed a simple E-commerce website that was clean and simple, but functional and secure. Without feeling tech-savvy, Julie and Kirsty needed a site they could manage themselves without overwhelm, stress or hassle. This is great, EXACTLY the sort of solution we need... You have cheered me up... Thank you! 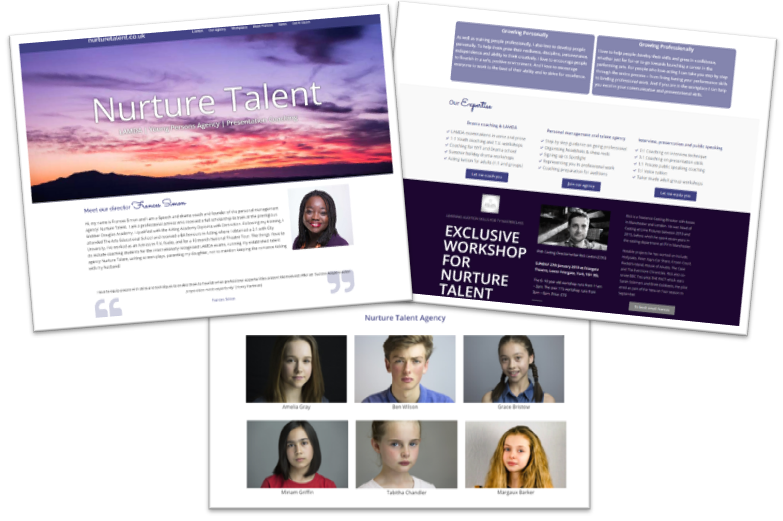 Meet Frances Simon and Nurture Talent – a drama coach, LAMDA instructor and talent management agency. 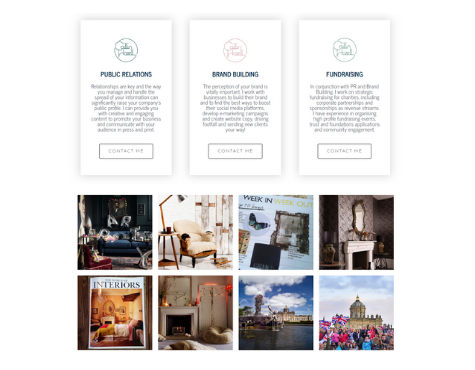 Frances needed a highly informative new website that could compete with the London-based agencies. Her old site (designed and built elsewhere) was extremely out-dated and did not reflect her professionalism at all. with extremely limited time and little techie inclination, Frances needed a web-company that could update and develop her site without her needing to micro-manage them or get her hands dirty with the technology. Mits Griffin provided a hands on personal service that was exactly what I needed at the right time. She was incredibly flexible and worked around my time constraints and gave me really practical advice concerning my website. She certainly has a talent for this which is fabulous. Her input has been a God send for me. 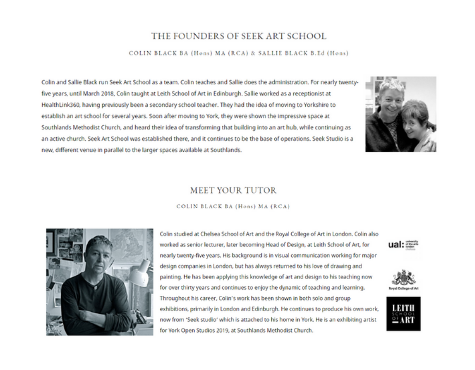 Meet Seek Art School, a newly launched school in York. 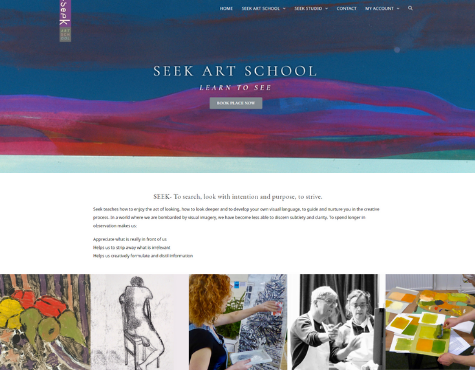 Seek Art needed a highly customised and bespoke E-commerce website so that their students could book courses online while presenting a portfolio of all their courses, classes, workshops and expertise in one place. 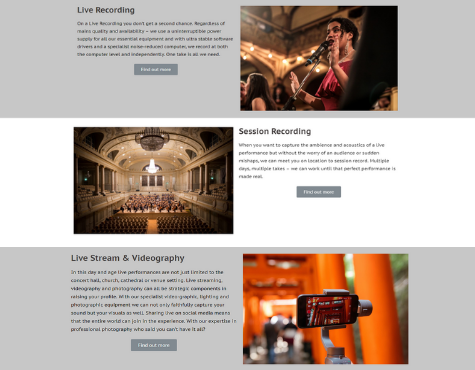 Being creative directors, Seek had an extremely specific design brief and we had great fun as they contributed to every aspect of their site. Meet Stuart Priest – Greatest Showman extraordinaire. Stuart needed a colourful, fun and quirky information website for a colourful, fun and quirky non-profit social enterprise. 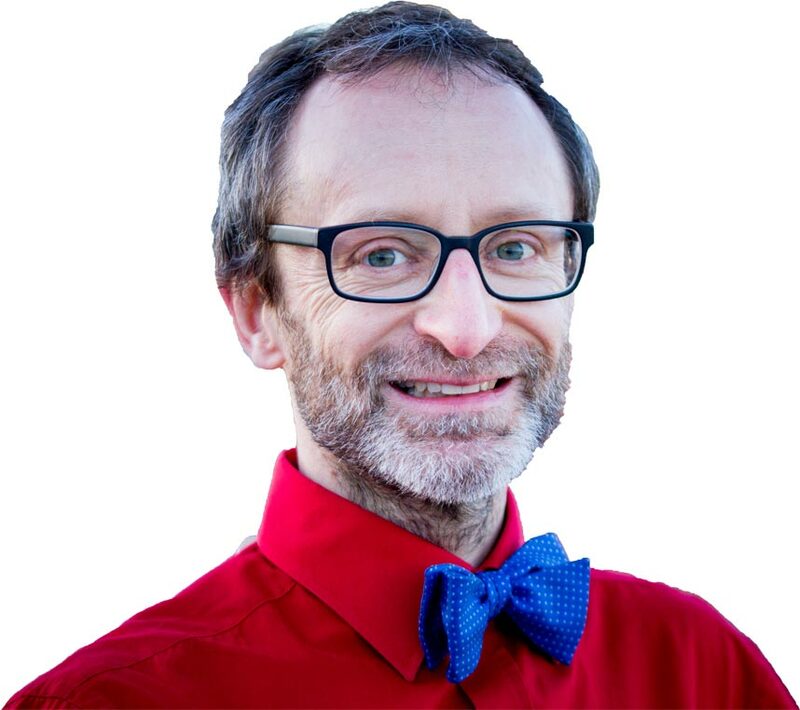 Being highly tech-savvy but time limited and without website expertise, Stuart needed a web-company that could design a site that incorporated marketing strategy that he could later update and manage himself. Starting up a new business from scratch is hard work with so many things to do. After a little searching, I discovered the amazing Mits Griffin - a technically talented person with amazing creativity both visually and content-wise. Mits takes you through the process to make sure that you achieve what you want. Apart from being very easy to work with, she has a great eye for design and a real flare for marketing. Before I knew it Mits produced a visually stunning multi-page site and all I had to do was provide some basic content. 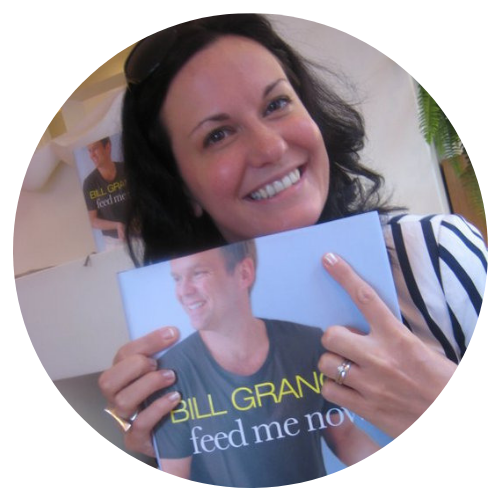 Despite my worry about investing in a site, my website brought in £5500 in sales in its 1st year! And since I began with nothing that was a brilliant return on my initial investment! I would not have achieved that without Mits! Meet Kerstin Wandel – Course creator and trainer. 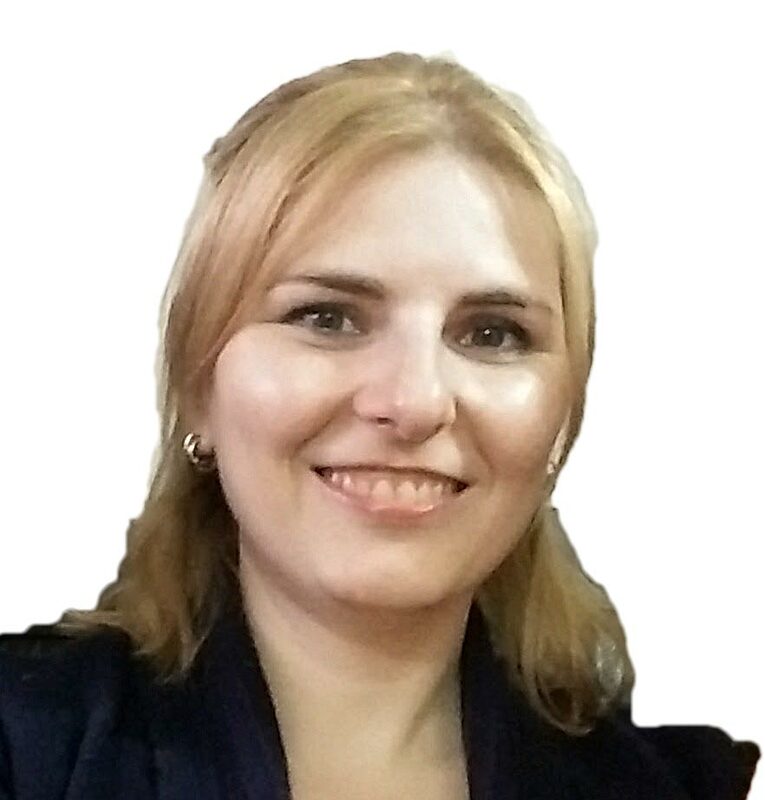 Kerstin needed a Knowledge-Commerce website and had already invested as a start-up business in the Kajabi platform. 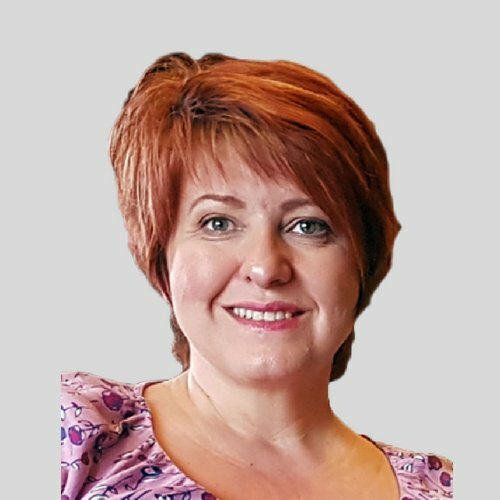 Lost in the Kajabi environment, Kerstin needed a company that could take her initial investment and maximise it. Over time, her business has evolved and her Kajabi website gone. But watch this space for her latest website development due to launch later with her re-invented company later this 2019. Mits hears your heart and then uses her amazing tech skills to present your vision in a most compelling way. 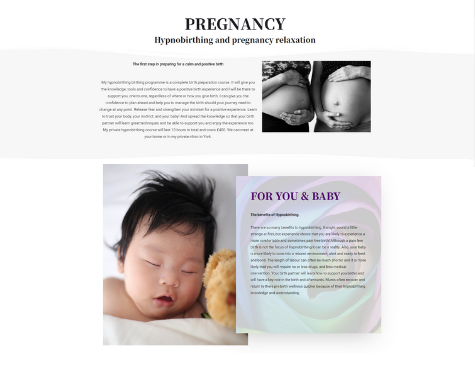 We have only started working together, but already I am absolutely blown away by how she has turned my ideas into tangible and concrete (not to mention beautiful) action points on my website. I have gone from despairing and feeling constantly overwhelmed to a, "WOOHOO, it's really gonna happen!!" attitude right after the first contact. And this has not stopped. She explains matters in a way that I can understand without exception and creates a pathway for me to work along. I am a fan! Mits Griffin knows her stuff and is the person you want by your side when venturing out into business. 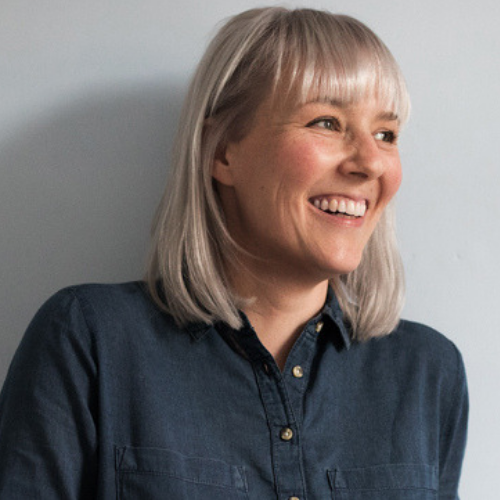 Meet Annina Diston – art director, graphic designer and model maker. Annina had already invested in a business website which needed updating. She required expert help behind the scenes to get her website content in order and the technology secure and upgraded. Mits has helped me sorting out lots of back-end bits of my website. It's an absolute pleasure working with her! Mits is very knowledgeable, organised and super friendly. Only the best people have questions.